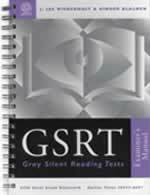 The Gray Diagnostic Reading Tests Second Edition (GDRT-2) has been revised and updated to reflect current research in reading. 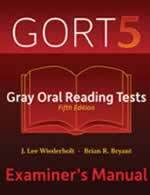 The GDRT-2, a revision of the Gray Oral Reading Tests-Diagnostic (GORT-D), along with the Gray Oral Reading Tests Fifth Edition (GORT-5) and the Gray Silent Reading Tests (GSRT), form the Gray reading test battery. The GDRT-2 assesses students who have difficulty reading continuous print and who require an evaluation of specific abilities and weaknesses. Two parallel forms are provided to allow you to study a student's reading progress over time. Teachers and reading specialists will find this test useful and efficient in gauging reading skills progress. 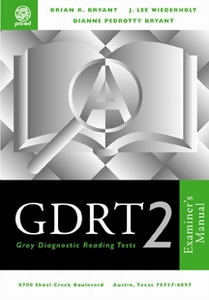 The GDRT-2 has four core subtests, each of which measures an important reading skill. The four subtests are: Letter/Word Identification, Phonetic Analysis, Reading Vocabulary, and Meaningful Reading. The three supplemental subtests, Listening Vocabulary, Rapid Naming, and Phonological Awareness, measure skills that many researchers and clinicians think have important roles in the diagnosis or teaching of developmental readers or children with dyslexia. The GDRT-2 was normed in 2001-2002 on a sample of 1,018 students ages 6 through 18. The normative sample was stratified to correspond to key demographic variables (i.e., race, gender and geographic region). The reliabilities of the test are high; all average internal consistency reliabilities for the composites are .94 or above. Other major improvements include: Studies showing the absence of culture, gender, race, and disability bias have been added, and several validity studies have been conducted, including a comparison of the Wechsler Intelligence Scale for Children-Third Edition (WISC-III) to the GDRT-2. To administer this test at least a master s degree is required, with state licensure OR certification from a professional organization (ASHA, AOTA, APA, AERA, ACA, AMA, NASP, NAN, INS) that requires formal training and experience in ethics, psychometrics, statistics, and scoring and interpretation. Tests of perceptual, academic, and functional processes used in schools, clinics and rehabilitation settings are of this level. All test users, regardless of level and profession, are expected to abide by the standards set forth by the APA, AERA and NCME regarding the ethical use, protection and dissemination of all test materials. All orders for the products listed below, must be placed on official institutional purchase order forms or professional letterhead. Orders for items on this page cannot be completed online. Please attach completed qualifications form to your institutional purchase order or professional letterhead when ordering this product.